To hide text in Word is useful when you need to print two different version of a document. 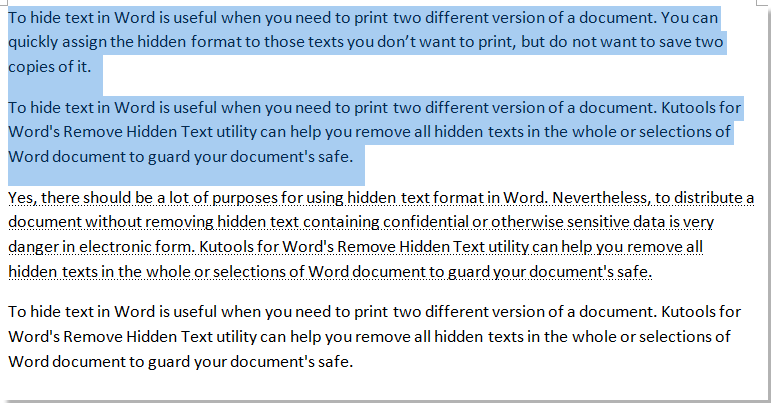 You can quickly assign the hidden format to those texts you don’t want to print, but do not want to save two copies of it. 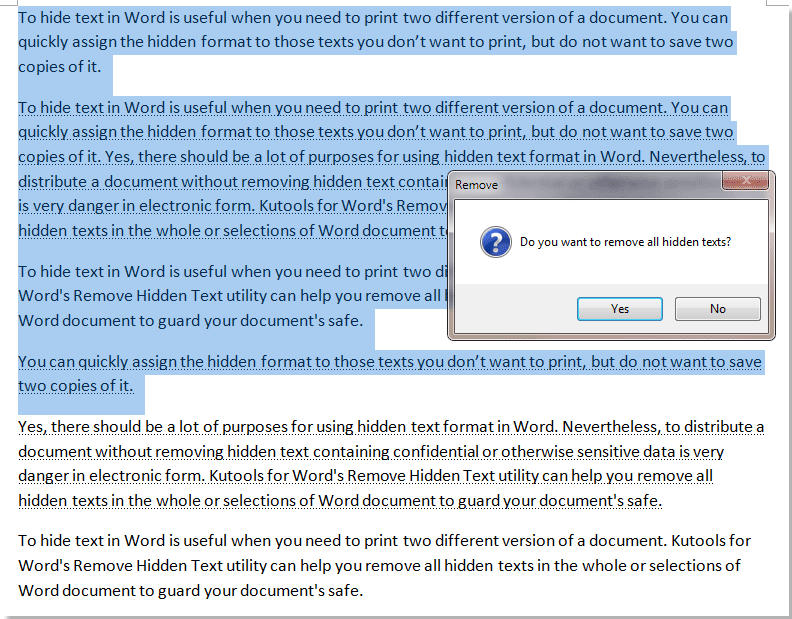 Yes, there should be a lot of purposes for using hidden text format in Word. Nevertheless, to distribute a document without removing hidden data or text containing confidential or otherwise sensitive data is very danger in electronic form. 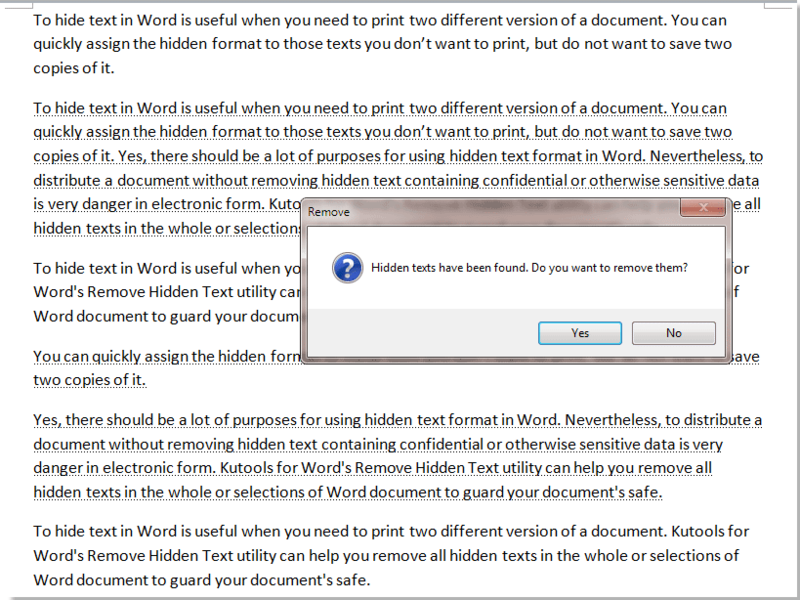 Kutools for Word's Remove Hidden Text utility can help you remove all hidden data or texts in the whole or selection of Word document to guard your document's safe. Please open the document which contains hidden data or text you want to remove, apply the utility by clicking Kutools > Remove > Remove Hidden Text and then click Yes. Tip: you can show the hidden data or text in your document by clicking File > Options > Display > please checked Hidden text in Always show these formatting marks on the screen section. You can also go to toggle the hidden text on and off by using the Kutools for Word's Display Settings utility. All hidden data or text in the whole document has been removed. 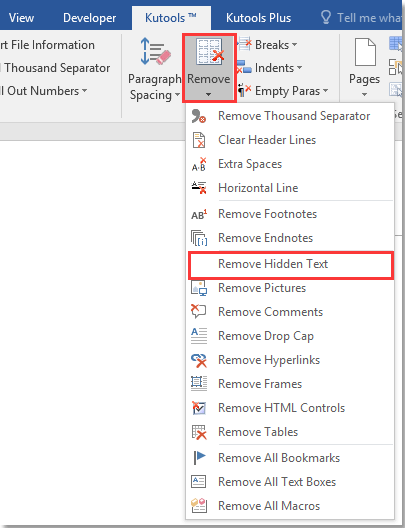 If you just need to remove all hidden text from a part of document, please select a part of document first, and then applying the utility by clicking Kutools > Remove > Remove Hidden Text and click Yes to remove all the hidden text from your selection. Tip: you can show the hidden data or text in your document by clicking File > Options > Display > please checked Hidden text in Always show these formatting marks on the screen section. You can also go to toggle the hidden text on and off by using the Kutools for Word's Display Settings utility. All hidden data or text in the selection has been removed.